Robert Donald Bruce Fraser was born in England on 14 August 1924 and was educated at Harrow Weald County School. After matriculating in 1941, he joined the Kodak Research Laboratories as a laboratory assistant and commenced a part time BSc degree course at Birkbeck College, University of London. In 1943, he volunteered for Aircrew Duties in the Royal Air Force and served as a pilot in both Europe and South Africa. In 1946, he commenced full-time studies at King’s College, University of London and graduated in 1948 with 1st class honours in Physics and Mathematics. It was helical, with the phosphates on the outside and the flat bases stacked inside. The bases on one chain were hydrogen bonded to the bases on the other chains. The model had most of the features of the Double Helix except of course that there were three chains instead of two, and because of that, could not have the very special and unique system of base pairs which was such a staggering feature of the Watson and Crick model. The reason why the Fraser model had three chains was that we at King’s thought that density and water content data on DNA meant that there were three chains. We barely considered that there were only two chains. We were not alone in making that mistake: both Pauling and Astbury fell into the same physical chemistry trap. A discussion on the model is available by following the external link of the Pauling Blog in the Related information below. In 1952, Bruce and his wife Mary (who he had met in Wilkins lab where she worked on the biochemistry of DNA), migrated to Australia with their newly born daughter to take up a position with the recently formed CSIRO Biochemistry Unit in Parkville ‘ which in 1959 became the Division of Protein Chemistry. Over the next 35 years he would lead the research at Parkville into the 3D structure of keratins and collagen. Techniques employed included infrared absorption; birefringence of stretched and normal fibres; histology of the wool fibre and enhancement of fibre characteristics by means of shadow casting. With Tom MacRae he conducted pioneering X-ray diffraction studies on various fibrous proteins. The collaboration between Bruce and Tom continued until both retired in 1987. Keeping in mind the protracted investigations needed by Perutz at this time for the determination of the structure of myoglobin using X-ray diffraction of crystals grown from highly purified protein samples, it is not surprising that the studies on keratin, a tissue containing heterogenous mixtures of several keratin protein families, should continue for more than three decades. As the early data accumulated, Bruce, Tom and various colleagues started theorising about the molecular orientation and configuration of Î±-keratins. Bruce was awarded a DSc from London University in 1960 and during the next decade he and Tom MacRae expanded their pioneering studies on the tertiary structure of keratins; focusing on wool keratins. They wrote two important books: Keratins, Their Composition, Structure and Biosynthesis (CC Thomas, Springfield, Illinois) by Bruce Fraser, Tom MacRae and George Rogers in 1972 and the 628-page volume Conformation in Fibrous Proteins and Related Synthetic Polypeptides by Bruce Fraser and Tom MacRae, published by Academic Press, New York in 1973. In 1975, Bruce Fraser and Peter Tulloch, were guest lecturers at the Summer School on Fibrous Proteins run by the European Molecular Biology Organisation and held at the University of Oxford. In 1976, Bruce was a Visiting Professor at the Department of Macromolecular Science, Case Western Reserve University, Cleveland, Ohio, USA working with Professor Alan Walton on the 3D structure of synthetic coiled-coil peptides. In the early 1970s, the major focus on structural determination of collagen using X-ray fibre diffraction methods began, and ultimately led to a detailed description for the conformation of the polypeptide chains in the collagen molecule, with the helical parameters fully defined. Visiting colleagues Andrew Miller (UK) and David Parry (NZ) contributed to this research. 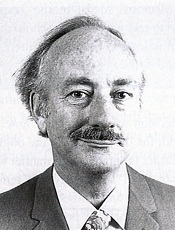 Bruce was Leader of the Protein Structure Group in the Division of Protein Chemistry for many years, Assistant Chief of Division from 1973 to 1983, and on the retirement of Gordon Crewther was Acting Chief of Division from 1983 to 1984. He accepted the position of Chief of Division in February 1985 with Colin Ward as his Assistant Chief. Later that year, on the 1st September 1985, Bruce Fraser commenced a five months stay at the National Institutes of Health (NIH), USA as the first part of a 12 month Fogarty Fellowship. During this period, Colin Ward served as Acting Chief of the Division. The period following Bruce’s return from NIH proved to be very stressful marked by the upheaval that occurred in the wake of the McKinsey report into CSIRO. On the 28th May, 1987 the findings of the McKinsey and Co review were released. Its effect on the Division of Protein Chemistry (DPC) was major, as it recommended that the Division be split up into three parts. The Hides, Skins and Leather Program was to be attached to parts of the Division of Food Research to form a new Division, to be called Meat and Livestock Processing; the Wool and Fibrous Proteins Program was to be combined with the Divisions of Textile Physics and Textile Industry, to form the new Division of Wool Technology; while the remainder of the Division of Protein Chemistry (DPC) was to be amalgamated with the Division of Molecular Biology (DMB), North Ryde, the Biological Organic Chemistry group from the Division of Applied Organic Chemistry, and the Biotechnology and Industrial Microbiology Programs of the Division of Chemical and Wood Technology (DCWT), to form an expanded Division, to be named Bioactive Products. The Division of Protein Chemistry found itself in the difficult situation where its Chief and Assistant Chief had differing views about the proposed restructuring and the future of the Division. Bruce wanted the wool research to continue and was concerned that the transfer of the control of basic studies of wool to a Division which, in the past, had shown little sympathy for this type of work would inevitably lead to its demise. Colin, on the other hand, favoured the phasing out of wool research at the Parkville site and the move to biotechnology. In May, Colin wrote to the Acting Institute Director, Warren Hewetson, agreeing with the proposed amalgamation of DPC, DMB and the two programs from DCWT, but suggested that the proposed new name (Bioactive Products) was inappropriate, and that Division of Biotechnology was preferable. He also argued that it was essential to follow through with the proposed rearrangements by bringing the DCWT staff from Clayton to Parkville, a move that would necessitate shifting the Wool and Leather groups off site. In a subsequent letter to the Acting Director, David Solomon, he also proposed that staff in the Wool Group be given the options of (i) redeployment to appropriate programs in the new Biotechnology Division, (ii) redeployment to the Hides, Skins and Leather Program or (iii) transfer to Wool Technology at Geelong. With regards to the first proposal – the offer was never made and it took until 1990 before there was final agreement to move the Wool and Leather Programs (both now part of the Division of Wool Technology) to Geelong and Clayton respectively. On 4 August 1987, David Solomon announced to the Parkville staff that Bruce had decided to take early retirement at the end of August. He also announced that Colin would not be appointed Acting Chief for the interim period while the search for a new Chief was undertaken. Yes. He still had three or four years to go, I think, but he chose to retire on the same day that I did, and I found this very touching. In my speech just to the lab staff, when we had a little celebration, I commented that it was odd to me that he and I had worked together for something like 32 years yet I couldn’t ever remember a cross word between us. I attributed this to his absolutely wonderfully tolerant nature. When he gave his little speech, he said he didn’t think it was that at all. Rather, the clue was that we’d both been flying in World War II and, under those circumstances of service life, you really have to learn to laugh at adversity. With their retirement, the end of an illustrious era in research on the structure of wool and fibrous proteins came to an end. Their pioneering investigations into the structure of wool keratin, collagen and the silk fibre using X-ray diffraction and infrared spectroscopy had brought distinction not only to themselves but also to the Division and to CSIRO. Up until his retirement from CSIRO, Bruce was the author of 149 publications including the 324-page book with Tom MacRae and George Rogers on Keratins, in 1972 and the 628-page book on Fibrous Proteins with Tom MacRae in 1973. Following his retirement Bruce completed the remaining seven months of his Fogarty Fellowship at the National Institutes of Health, USA. Since then he has continued to publish original contributions to the structure of fibrous proteins for over 25 years. In 1993, an International Workshop on ‘Coiled-Coils, Collagen and Co-proteins’, organised by the European Molecular Biology Organisation, was held in Alpbach, Austria to honour Bruce Fraser and Tom MacRae for their outstanding contributions as pioneers in structural biophysics. For Bruce’s personal reflections on his career see the interview with Professor George Rogers available by following the external link of the Australian Academy of Science in the related information below. He received several honours and awards during his distinguished career. Wilkins M, 1995, ‘Origins of DNA research at King’s College London’, In: DNA structure: Genesis of a Discovery, edited by Seweryn Chomet, Newman-Hemisphere.